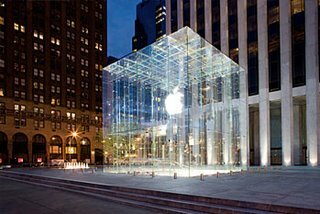 On May 19th, 2006 Apple opened its stunning Fifth Avenue store to commemorate the fifth anniversary of the day that it opened its first retail store to heavy criticism. The cube shaped store is a made entirely from translucent glass and is nestled within some of the best retail space in all the world, neighboring Bergdorf Goodman and Central Park. I have been reading an interesting book called “A Thousand Barrels a Second” by Peter Tertzakian. This book approaches the Oil Question from a very analytical perspective allowing the reader to appreciate the severity of the impending crisis. Here was what I found most interesting. Although the Middle East holds the largest reserves of oil and is largest producer of oil worldwide, Canada is the largest supplier of oil to the US. 1. The Middle East supplies a grade of oil called Light Crude or Sweet Crude that has a low content of Sulfur, is easier to excavate, and easier to process due to its lighter viscosity. Until recently, it has not been commercially viable to extract a majority of the Canadian reserves. 2. Canada has a vibrant free market economy. There is nearly over a billion dollars worth of commerce that takes place between the 2 countries daily in everything from softwood lumber, cars manufactured in Canada, to agricultural products. The Canadian government has been a friendly and politically stable ally of the US and so Canadian Oil never makes the evening news. 3. 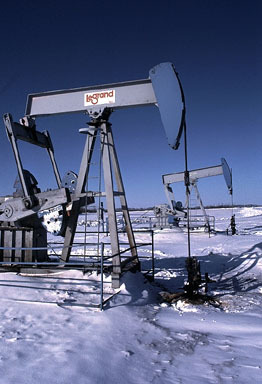 The US has been the primary market for Canadian oil due to its proximity and the restrictive cost of transportation. This also guarantees America a steady flow of fair priced oil to be piped in through a relatively secure neighborhood. Then why must the U.S care about Canadian Oil? 1. The risk of excavating and transporting crude has escalated due to the instability in the Middle East, and from traditional suppliers like Nigeria and Venezuela. This instability, coupled with better technology has made it viable to excavate Oil from the Canadian prairies in large quantities. 2. The demand for Oil from developing countries like India and China has steadily escalated. In response, Canada has begun a project to build a pipeline to pump Crude Oil from the Albertan prairies to the ports in B.C. This will make Canadian Oil a commodity in the open market, allowing Canada to demand a better price. 3. The recent trade spat between the Canadian government and the U.S at the WTO over Lumber, Canadian beef and Agricultural exports has made Canada wary of depending on just one supplier for their abundant raw material. The energy question is undoubtedly the most important factor that will shape the future of International politics and interestingly enough the shape of U.S – Canada cross-border politics. More than a million immigrants in the United States took part in a day of nationwide action to protest against proposed immigration reform. The protests are aimed at persuading Congress to abandon the tough measures in a bill passed last year by the US House of Representatives that includes provisions to criminalize illegal immigrants and bolster border security. Mass rallies were staged across the US as immigrants boycotted work or school and avoided spending money as a way of showing their worth to the economy. Called a Day without Immigrants, the protest took place as Congress wrestles with reforming immigration laws. 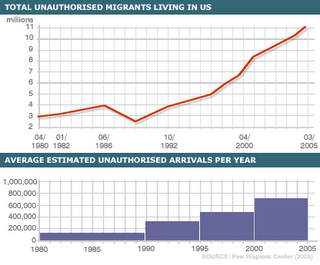 About 11.5m illegal immigrants live in the US. Demonstrations were held in up to 100 cities and towns – including Chicago, Los Angeles, Las Vegas and New York.